Yikes! This post is coming a bit later that I hoped, but I am sitting down at my computer and will not get up until I share with you a trip I took up north to Rensselaer last Thursday. It was a treat on many levels! 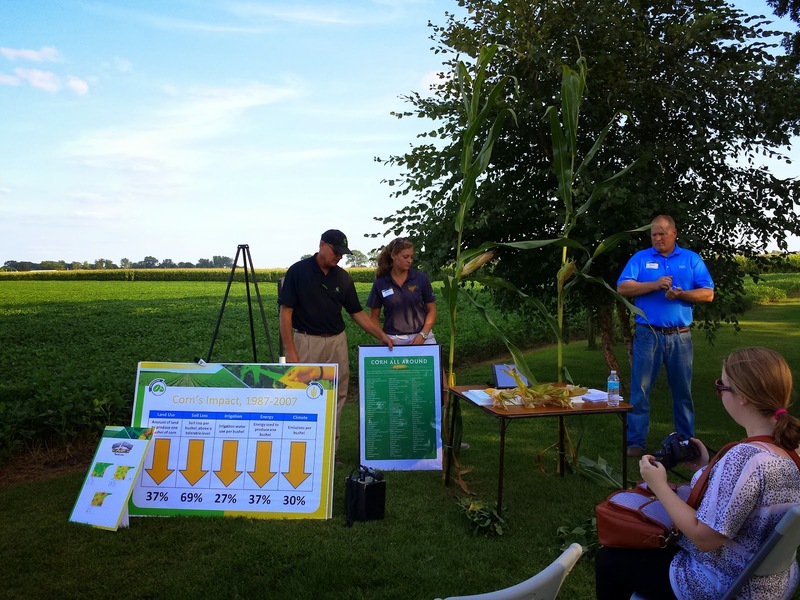 Jasper County farmer Kendell Culp and his family opened up their farm/backyard to a variety of county officials, Ag media, and neighbors to talk about "Modern Farming" and how it works on their farm. 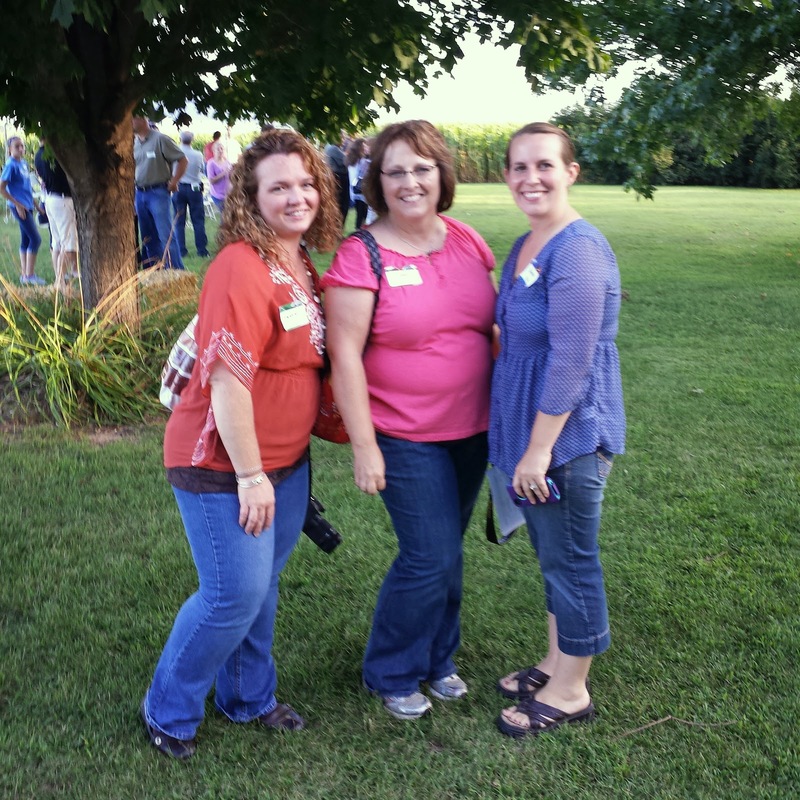 It was great to be there because even though I have known Kendell and Tammy for many years, this was the first time I visited their farm. Here to to put their own take on the evening are two of my blogging pals, Crystal from Chasing Saturdays and Stacy from The Backroad Life. This gathering was pretty much in their backyards! This event started off with a "social gathering." 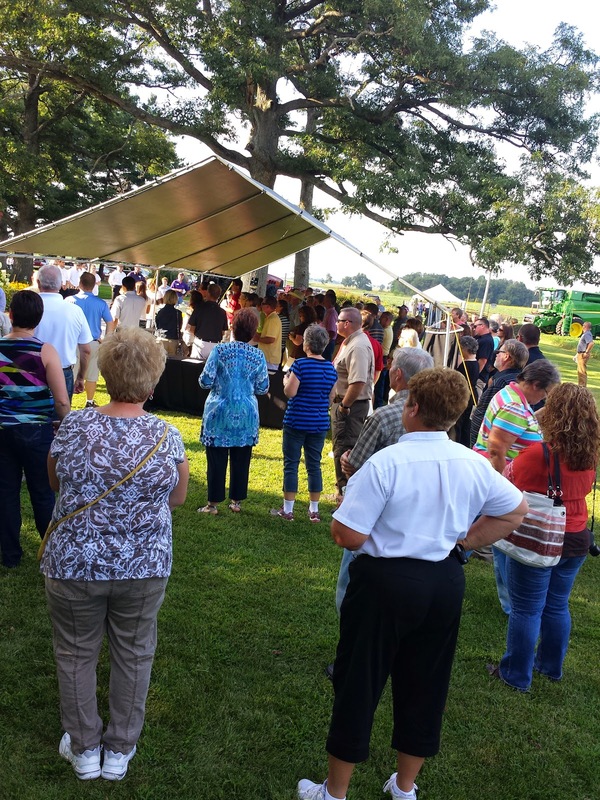 We were treated to sampling wine from Carpenter Creek Cellars, which I passed on 231 on my way to Rennselaer, and cheese from Fair Oaks Farms as we moved around the crowd and mingled with familiar faces and new friends. As we broke into groups and visited the three main areas set out for us, it was just nice to see everyone enjoying themselves. 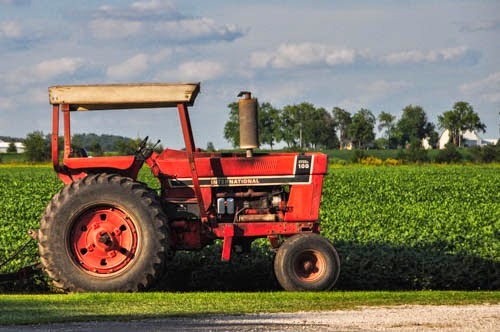 I often forget that, outside my immediate world, there are quite a number of people who have never been on a farm. There's nothing quite like a cool afternoon listening to the locus chirp, the corn stalks rustling in the breeze, and the occasional hum of a bee.......or was it a bee???? 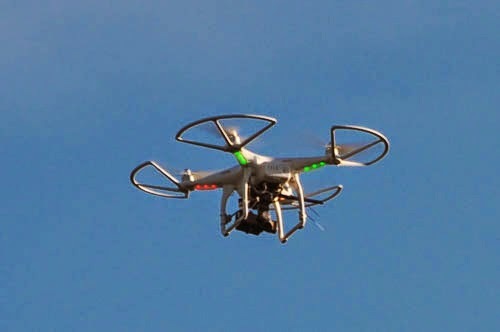 At our Technology stop, we were able to see this UAV go to work. 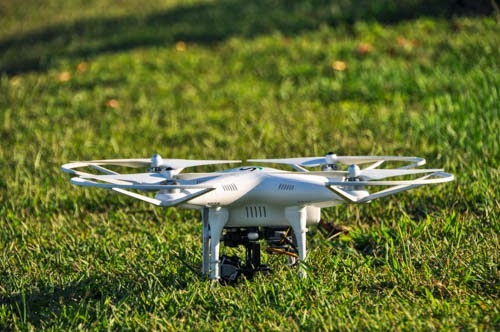 As our speaker told us, this UAV (Unmanned Aviation Vehicle) is going to change how we monitor our fields. 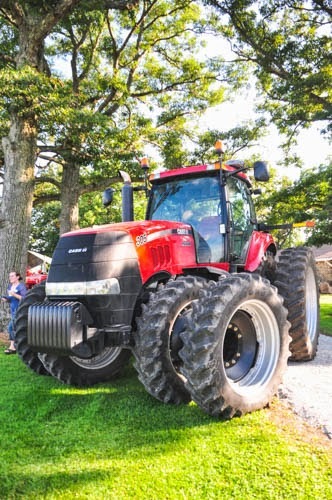 It buzzes through the air, and thanks to the Go-Pro camera mounted to it, it allows farmers to truly see out in to the middle of the fields to check for situations like wind damage, insect issues and general condition of the fields. 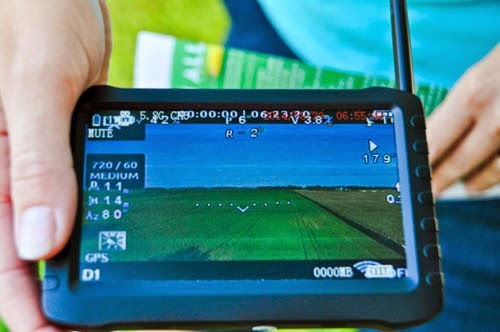 This is the receiver that allows a farmer or field specialist to see what the UAV sees. For those of us with flat crop fields, this device is a game changer as far as knowing and seeing how a crop is growing. 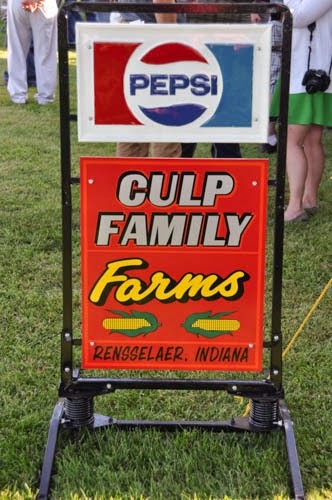 At the sound of a horn, we moved on to the row crop part of the Culp farm. 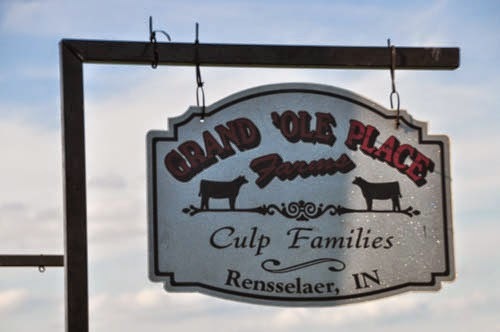 Here, too, technology in the form of GPS helps farmers like the Culp family learn how to make the most of each seed that goes in the ground. 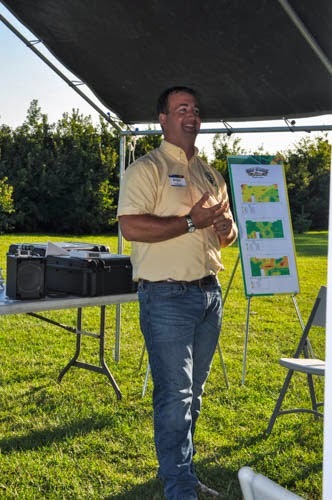 Precision planting leads to optimal use of ground, fuel, and maps generated from its data. 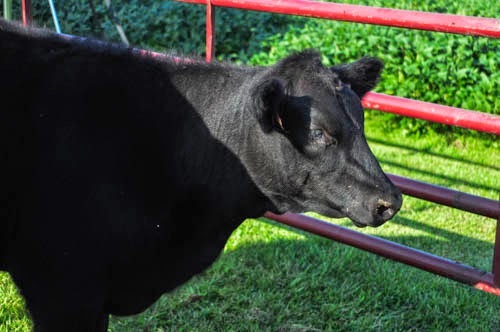 The final aspect to the Culp farm comes in the form of livestock. 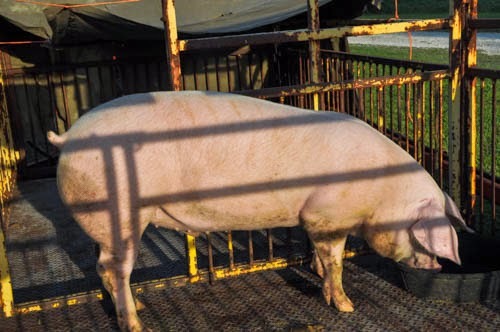 Kendell and Tammy Culp can be found every Saturday morning hanging out around Jasper County's courthouse selling freezer cuts of their hogs to all who attend the Jasper County Farmers' Market. Kendell's brother likes to work with cattle. 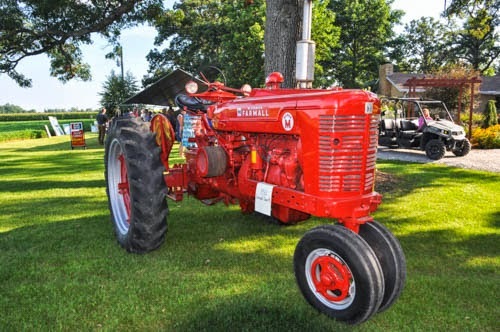 In between these three areas, visitors were able to stroll through the lawn looking at farm equipment, both old and new. 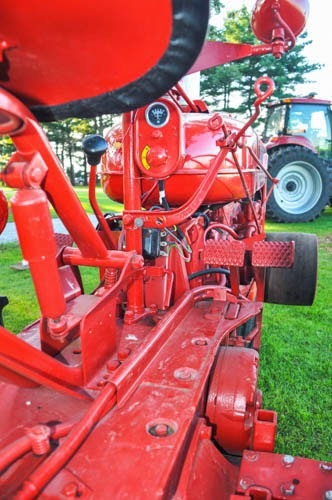 The message from these machines is two-fold: One is the fact that farming today was NOT the way Grandpa did it 50 years ago. 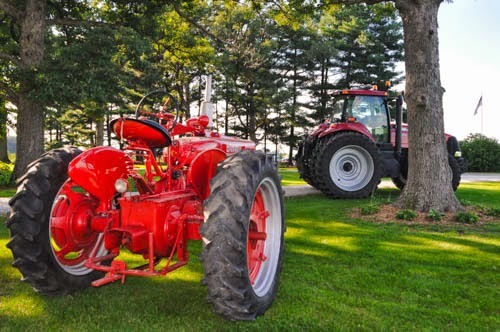 This dear old horse is all pretty again, but back its day, he plugged right along the fields. 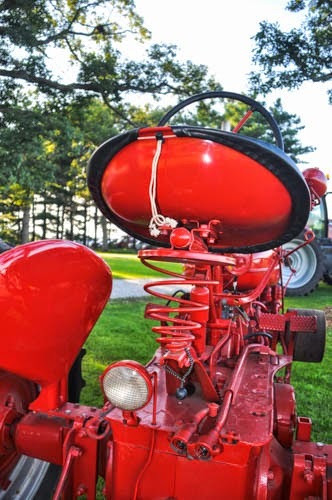 LOVE this "catcher's mitt" seat, and you can see, no shade or cool air for these farmers; they were at the mercy of the clouds. Now here is where Kendell and his family wanted to spark us to do math in our heads. 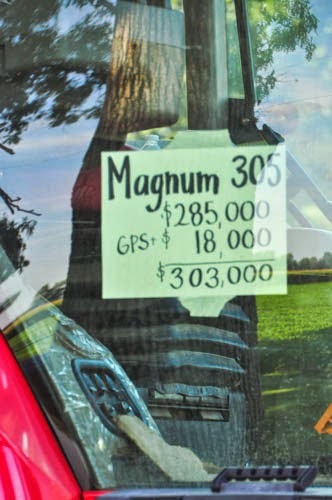 Yep, this tractor, with GPS capabilities will set you back $303,000.00 dollars! 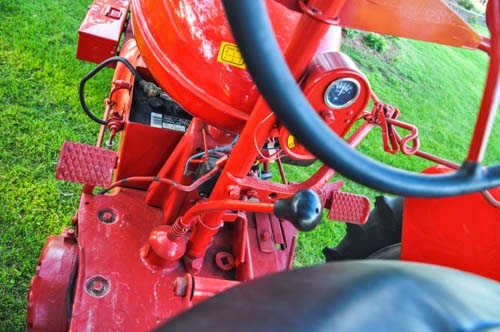 And I hate to break it to you, but a tractor isn't too helpful by itself, so the farmer also needs to buy a planter, and often an implement to till the ground, so you know the farmer is going to have to dig a bit deeper to make this purchase practical. Kendell works with his dad and son; this is not anyone's "factory farm." These gentlemen need to be market-savvy, mechanics, technology-friendly, meteorologists just to be ready to go to the field to plant, spray, and harvest. This is why you will see veteran machines like this one being used and, at times pampered so they will continue to be useful for many more years. 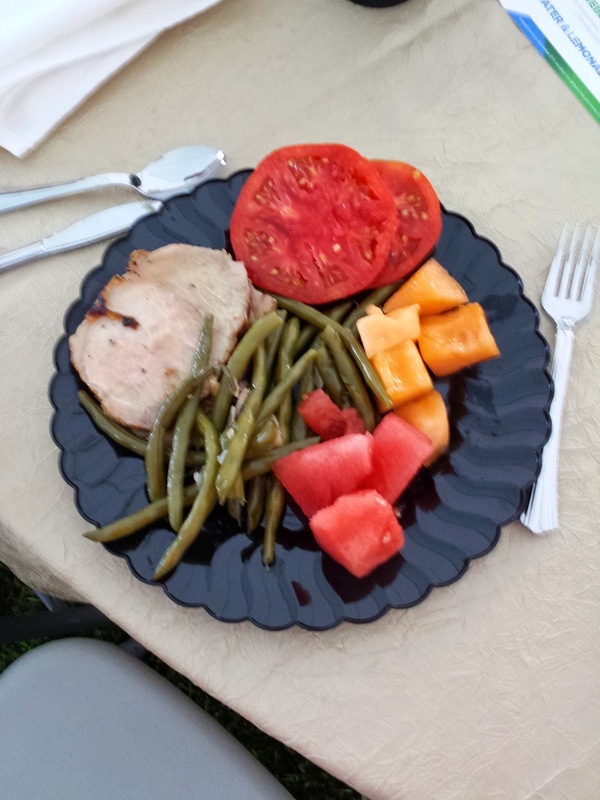 After everyone made it through their three stop sequence, we were treated to a meal from Jasper County. Now any of you out there who were raised in the country or with a large family garden, knows that the day you sit down to eat food COMPLETELY produced by you or your family, well that day is a special one. We had such a meal at the Culps. Sorry about the fuzzy words, but I promise it all came from Jasper County farm families. 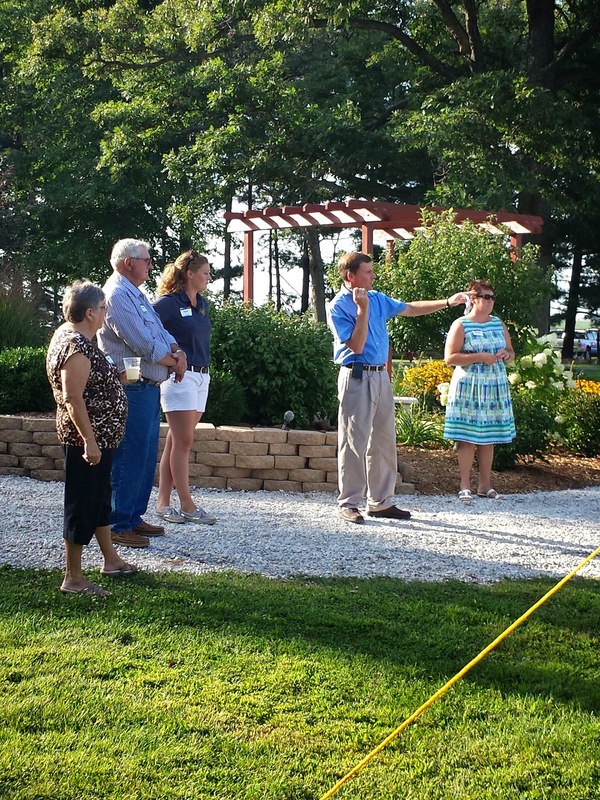 I would like to extend my thanks to the Culp family for allowing me to join them in this presentation of their farm. 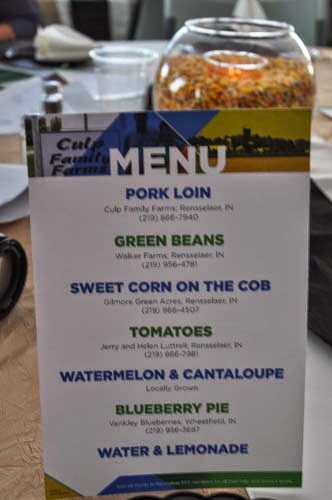 I would also like to give a shout out to the Indiana Soybean Association and Indiana Family of Farmers. 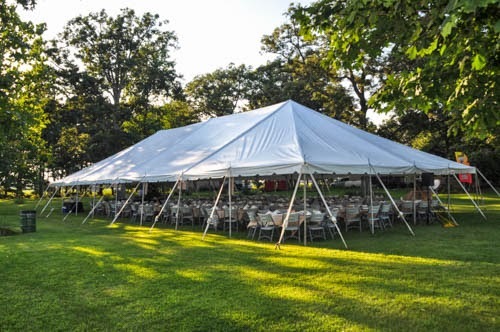 Don't forget to hop on over to Crystal's blog, Chasing Saturdays, and Stacy's blog, The Backroad Life for their takes on this night on the farm. I was paid for this commentary on what I saw on the Culp farm by IFOF, but I would have gladly done it for free! These observations are all mine.